The centre-back was released from Worthing last month having joined the Premier Division outfit from Burgess Hill in the summer. 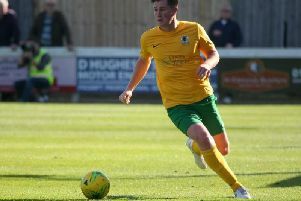 Despite limited game time due to missing virtually the whole of last season with injury, he made his debut in Horsham’s 1-1 draw with Hastings United, slotting in at centre-back having not trained with the team. He met team-mates in the changing room before kick-off, yet put in a solid showing alongside Joe Shelley. Horsham boss Dominic Di Paola saw bringing the defender in as a decision that worked well for both parties, but is aware the player is still pursuing other avenues. He said: “Will is a welcome addition. It came out the blue a little bit after his release from Worthing. He is best mates with Lee Harding, so I asked Lee what he was doing. “He had a few different offers, but we had a chat as it is somewhere (defence) that we might be a bit short. “It’s a signing that I do not think will be forever, but with Lewis Hyde missing two of the 13 games we have left and Dylan Merchant with this back problem – although we seem to have had some good progress with that – I did not want to be light in that position.